For years now I’ve had friends, acquaintances, colleagues, students, clients and, well, pretty much anyone who’s eaten my cooking, tell me I should a) teach a class, b) write a book, c) do a cooking show, d) open a restaurant, e) or do catering. My reaction has always been, “eh, not so much.” I love to cook, teach, write, perform, and sometimes even serve, but not full-time, not as a real job. So I’ve confined myself to casual barter and a few random posts on cooking. That may be changing. I’m spending a considerable part of my down time contemplating the ideas that persistently rise up, teaching cooking, having a specialty line, writing a cook book, all have their charms. My emphasis this week has been on convenient, healthy, frugal foods. I’ve been eating variations on yellow rice and beans all week. I cooked a pound of red beans in the slow cooker overnight. Then cooked a family-sized package of yellow rice (makes about 8 cups). I took about 4 cups of the beans and packaged them in Ziplock baggies in the freezer, and refrigerated the balance in a covered bowl. The rice was also refrigerated. Meal 1: heat medium skillet, add splash of olive oil. While oil heats, quickly dice zucchini and mushrooms. Pulverize 1 clove garlic in press or under knife, add to veggies sauteing along with parsley and a little oregano and thyme. Stir in 1 cup yellow rice and 1/2-2/3 cup beans. Mix until ingredients are hot. If they are too dry, drizzle broth, tomato or V-8 juice in while stirring to proper texture. Season with grated cheese or a splash of lemon juice. Meal 2: Microwave lunch: Put 1 cup rice and 1/2 cup beans in a microwaveable container. Grate directly into container: 1 small zucchini, 1 small carrot (or half each larger ones). Again, splash generously with V-8 or other tomato based juice or soup. Refrigerate until lunch. Heat, add grated cheese and enjoy. Meal 3: Savory version. Dice Zucchini, saute with minced garlic in olive oil. Saute yellow rice and beans (same 2:1 proportion as other recipes). with the squash. In food processor, roughly chop a large handful of green stuffed olives, a can of drained artichoke hearts, some capers, a few black olives, a clove of garlic and fresh herbs (basil, parsley, thyme, oregano, or rosemary might work well). Lightly pulse these ingredients along with a handful of red beans. 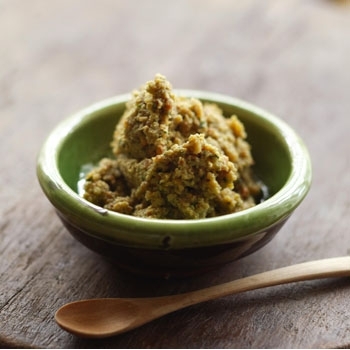 top sautéed beans and rice with a dollop of this tapenade and enjoy. 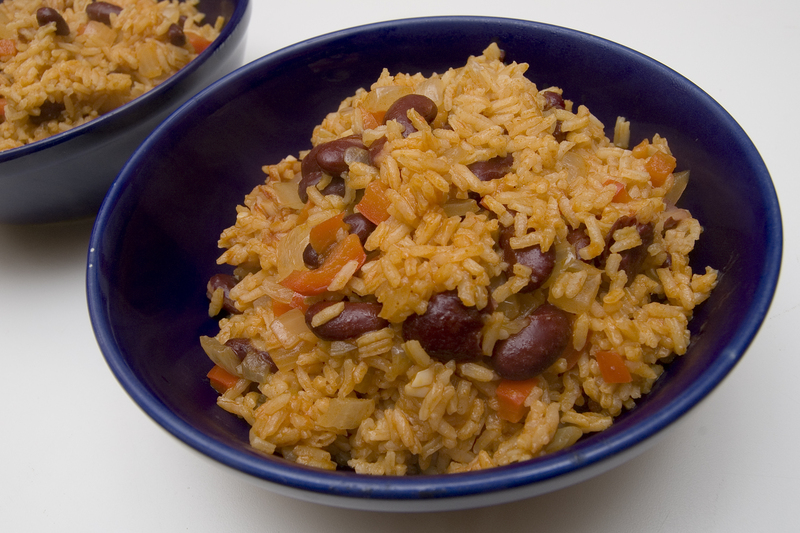 Whatever combination of savory ingredients (add almonds, diced tomatos, or the classic anchovies, for example) can be handled this same way for a wide array of flavors, all based on simple red beans and yellow rice. This entry was posted in cooking, Fusco's Kitchen, herbs, italian cooking and tagged beans, determination, food, frugal cooking, herbs, italian cooking, recipes, rice by octobia. Bookmark the permalink. Great food, will try out all those ideas, thank you. Nice recipes for me to try. I can still get a couple of nice meals even without the cheese or anchovies which I don’t eat. Red beans are very tasty. I always like recipes that are easy to customize for different dietary needs. A squeeze of lemon and a little salt often add the zip that cheese provides. Thanks for reading!